Although hiking in snowy conditions is not easy, it can be an unforgettable experience to wander around an amazing snow-covered landscape. To be comfortable and safe on snowy trails you will need some additional gear, like insulated clothing, winter hiking boots and gaiters. 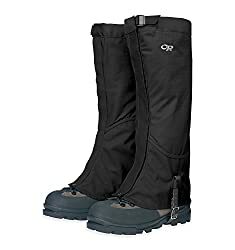 Gaiters are very useful for hiking on snowy trails because they prevent snow and dirt from entering your boots – and few things are more annoying than having snow melting inside your boots. Gaiters are worn over the top of your boots and over the lower part of your pant legs. You attach them to the boots with an instep strap and lace hooks. 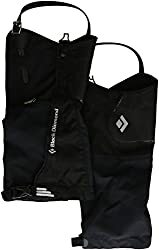 Usually, they also have a drawcord at the top which ensures that they stay firmly attached to the pants thus preventing snow and dirt from entering in-between. 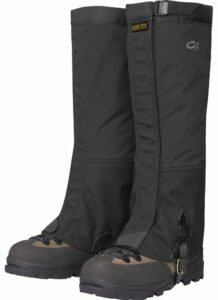 As gaiters keep your feet warm and dry while you are hiking in deep snow, they are crucial for comfortable winter trips. Here we selected the best gaiters for hiking to make your buying decision a little easier. We only listed lightweight products which provide good durability. 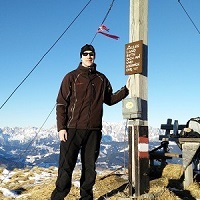 To learn how to put on a pair of gaiters check out our article How to use winter hiking gear. If you are planning to hike on icy terrain, we recommend that you also check out our reviews of the Best Crampons and Best Ice Axes. For those who plan to hike on trails covered with deep snow, we also selected the Best Snowshoes for Hiking. 1. 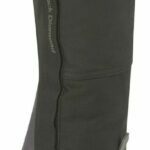 Buying Gaiters for Hiking – What is important? High-quality gaiters are made of a fabric that is not only waterproof but also breathable – like Gore-Tex, eVent etc. They typically utilize 3-layer waterproof/breathable fabrics because these fabrics provide the best durability and weather protection. They consist of a face fabric, membrane and a liner. The face fabric protects against the abrasion while the membrane prevents liquid water from the outside to enter but allows water vapor from the inside to pass through. Note that these layers are bonded together and thus not visible to the naked eye. To learn more about waterproof/breathable fabrics check out our Comparison of Shell Materials. The lower part of a gaiter is often reinforced with a resilient fabric such as Cordura or Kevlar for protection against abrasion. It is very common that a hiker accidentally gets his/her crampons hooked on the gaiters and tear them up. Therefore, a reinforced lower part is indeed a great feature. Gaiters should be lightweight as all other hiking gear. Lightweight gear allows you to hike faster and reach your destination easier. All products in this selection weigh less than 15 ounces (per pair). Read more about why it is important to use lightweight gear in our article Why hike lightweight. 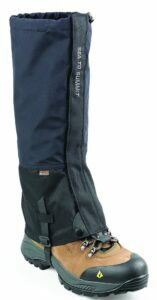 Gaiters should be easy to put on. Therefore, they are typically equipped with Velcro front entries which allow you to quickly attach them around the pants. Older models had zips which were difficult to use – especially if you were wearing gloves. Gaiters come in different heights – such as over-the-ankle, mid-calf and knee. Short gaiters are best for trail running while high can be used in all conditions. Therefore, we only listed knee gaiters in this selection. These are also suitable for trudging through very deep snow. Weight (pair) 10 oz. 8.1 oz. 7.4 oz. 9.4 oz. 9.7 oz. The Outdoor Research Crocodile gaiters are extremely robust and therefore perfect for mountaineering and tough expeditions. They are made of a 3-layer Gore-Tex fabric which provides great breathability, durability and weather protection. Furthermore, they are reinforced with a 2-layer Cordura fabric in the lower part. This is very practical because this part is very exposed to tears from crampons. Even though the Cordura fabric is sturdier than the Gore-Tex fabric, it does not significantly decrease the breathability. On the contrary, Cordura is known for being very breathable. 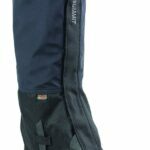 The Crocodile gaiters are also equipped with double-stitched Velcro front entries which allow you to put them on quickly and easily. The instep straps are made by BioThane – a well-known manufacturer of durable sport accessories. The straps are coated with a protective film and therefore provide superb durability. In addition to the instep straps they have lace hooks which ensure that they stay firmly on your boots. The top closures use cam buckles and therefore allow you to quickly adjust the right fit. The Outdoor Research Crocodile might not be the lightest product, but because they provide great durability and functionality, they rank first in this selection. Sizing: S fits shoe size 4-7 (EU 35-40), M fits shoe size 6-9 (EU 38-42), L fits shoe size 8-11 (EU 41-45), XL fits shoe size 10-13 (EU 43-47). The Black Diamond Apex GTX gaiters are very well-made. Because they are very light, they are perfect for ice climbing and other demanding activities on snow-covered slopes. They are made of a breathable and waterproof 3-layer Gore-Tex fabric. In the lower part they have an abrasion guard which is made of a welded 600-denier double layer fabric. This sturdy fabric efficiently protects them against abrasion and tears. Great fit is ensured with the neoprene-coated instep strap and lace hook which can be attached to the boot’s lace from the underside. The Black Diamond Apex GTX are also equipped with side-release top closures which can be easily used, no matter the conditions. Next to the buckles there are even reflective panels which help you find them in low visibility conditions. The hook and loop front entries allow you to put them on without a hassle. Sizing: S fits shoe size 6-8.5 (EU 38-42), M fits shoe size 8.5-10 (EU 42-43), L fits shoe size 10.5-12 (EU 43-45 ), XL fits shoe size 12-13 (EU 45-47 ). 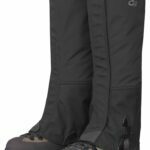 The Outdoor Research Verglas gaiters differ from the Black Diamond Apex GTX and Outdoor Research Crocodile listed above in fabric; instead of Gore-Tex, they are made of a 3-layer Pertex Shield fabric. The Pertex Shield fabric is super light, waterproof and breathable. However, it does not provide as good breathability as Gore-Tex because it uses a polyurethane coating instead of a membrane. 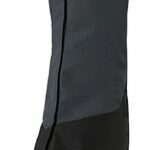 Due to the Pertex Shield fabric, these gaiters are the lightest product listed here – they weigh merely 7 ounces. The Outdoor Research Verglas otherwise have quite similar features as the Outdoor Research Crocodile; they have Cordura reinforced ankles, cam buckle top closures, Velcro front entries and metal boot lace hooks. However, some materials used on the Verglas gaiters are less durable than those of the Crocodile. For example, the foot panel is made of 1000-denier fabric on the Crocodile, while it is made of 500-denier fabric on the Verglas. The Outdoor Research Verglas are best for those who want extremely light product for different activities in snowy conditions. 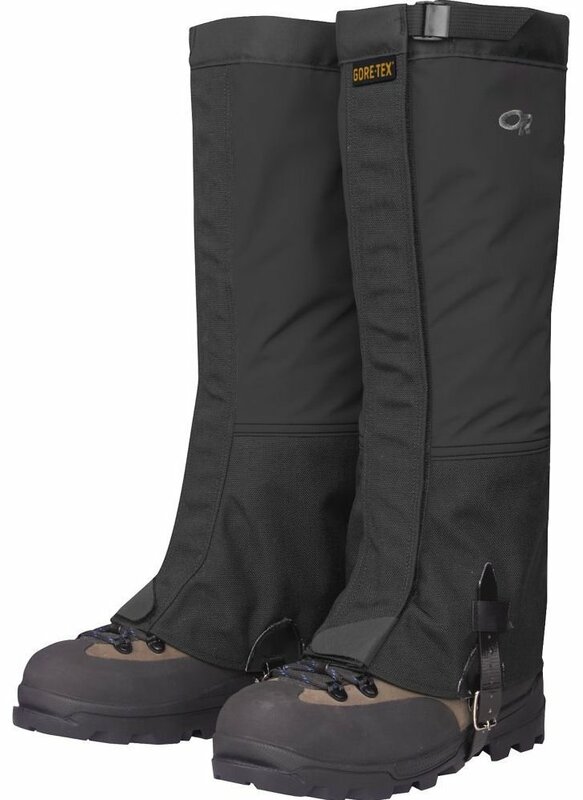 The Rab Latok Alpine gaiters provide great functionality. They are made of eVent fabric which is super breathable (more so than the Gore-Tex fabric) and very light. The eVent fabric has a hydrostatic head of 30.000 mm and MVTR (Moisture Vapor Transmission Rate) between 15.000 and 25.000 g/m2/24h. This is indeed a superb result. In comparison, the Pertex Shield fabric which is used for the Outdoor Research Verglas above has a hydrostatic head of only 10.000 mm and MVTR of 7.000 g/m2/24h and yet it provides good performance. The Rab gaiters are reinforced with Tough Robic nylon for increased durability in the ankle area. In addition to the high-quality materials, the Rab Latok Alpine also feature Velcro front closures, rubberized abrasion-resistant instep straps and single-hand drawcord top closures for easy use while you are wearing gloves. The Sea to Summit Alpine eVent is a pair of high-quality gaiters which meets the standards of even the most demanding hikers and mountaineers. The Sea to Summit Alpine are made of eVent fabric like the Rab Latok above. Therefore, they provide great breathability and protection. In the lower part they are reinforced with 900-denier nylon for better durability. The Sea to Summit gaiters are also equipped with Velcro front entries, cam buckle top closures, high-quality stainless-steel lace hooks and replaceable boot straps. The Sea to Summit Alpine eVent come in four different sizes to offer good fit. Sizing: S fits shoe size 4-6 (EU 35-40), M fits shoe size 6-8 (EU 38-42), L fits shoe size 8-11 (EU 41-45), XL fits shoe size 10-13 (EU 43-47). How to pack a backpack for hiking and backpacking?